Schiff’s statement was made immediately after the White House announced that Trump had directed the Office of the Director of National Intelligence and the Department of Justice (DOJ) “to provide for the immediate declassification” of parts of the FBI’s June 2017 FISA Warrant against Former Trump campaign aide Carter Page. President Trump also asked the FBI and the DOJ to release unredacted versions of all text messages pertaining to the Russia investigation from former FBI director James Comey, former deputy FBI director Andrew McCabe, former FBI agent Peter Strzok, FBI lawyer Lisa Page, and Ohr. Schiff believes Trump spoke with his “TV attorney” Rudy Guiliani and his allies in Congress to determine what should be released. Schiff notes that it was “unexpected” and “totally out of the blue. Schiff also explains that Democrats have been urging that interviews they conducted be released for months. “Why the sudden about-face? To be immediately followed by the White House following its own release. This is coordinated between the President and his allies. 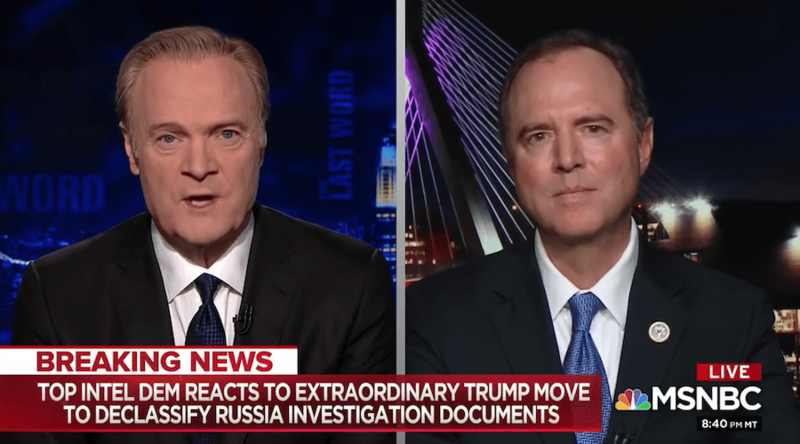 And the precedent, and policy, and the norm we’ve had since Watergate that a President does not interfere in specific cases of justice, let alone one in which the President himself is implicated is shattered,” Schiff added. “In the process, important sources and important precedent to protecting those sources may be violated by a President who cares little about national security,” Shiff explained. Politico has reported that the DOJ and FBI have no idea how the Trump administration’s redaction process is being handled. They also believe more documents could be released by Monday.